作者: Page Turning Maker Ltd.
Portable Document Format (PDF) is a file format used to represent documents in a manner independent of application software, hardware, and operating systems. PDF is popular used in different industries, like business and education. However for some purposes, we may need to transfer our PDF documents to other formats. And that is what Free Page Turning Maker PDF Converter can do for you. 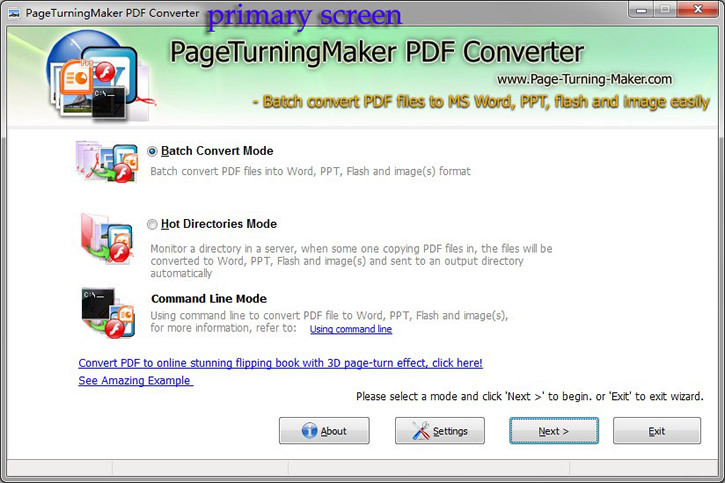 Free Page Turning Maker PDF Converter is totally freeware for you to batch convert any PDF files to other formats you need, it supports convert PDF to four different formats. Moreover it is quite easy-to-use and you will be impressed by its great efficiency. Don't hesitate! Let's experience Free Page Turning Maker PDF Converter right now.